The new novel by Dr. David Forster Parker is now available in bookstores and online. David Forster Parker has been employed in seventeen countries as a home builder, new community planner, and development executive. He received BSc (HH) and MUP degrees from Michigan State University and a doctoral degree in public administration from SUNY–Albany. He is the author of dozens of articles and books, both nonfiction and fiction. He lives in Florida with his wife, Marilynn. 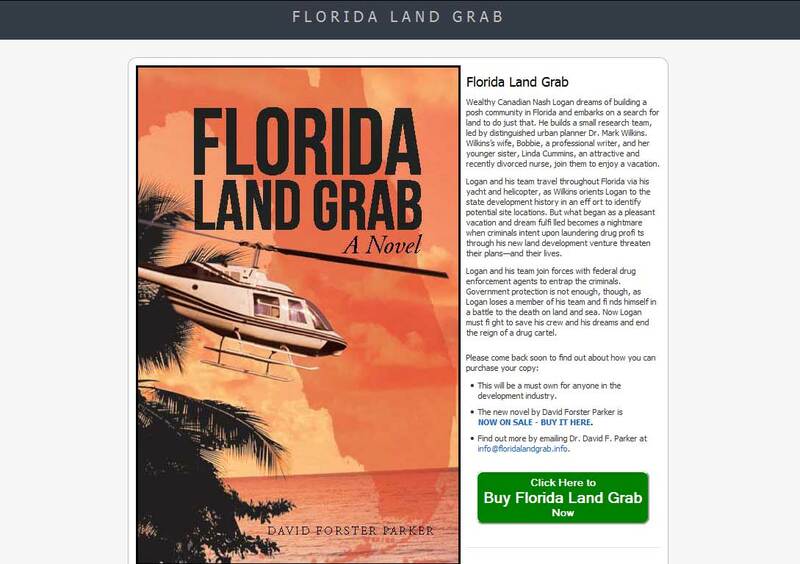 The website www.floridalandgrab.info has more information about the novel. If you would like more information now, email info@floridalandgrab.info. Wealthy Canadian Nash Logan dreams of building a posh community in Florida and embarks on a search for land to do just that. He builds a small research team, led by distinguished urban planner Dr. Mark Wilkins. Wilkins’s wife, Bobbie, a professional writer, and her younger sister, Linda Cummins, an attractive and recently divorced nurse, join them to enjoy a vacation. Logan and his team travel throughout Florida via his yacht and helicopter, as Wilkins orients Logan to the state development history in an effort to identify potential site locations. But what began as a pleasant vacation and dream fulfilled becomes a nightmare when criminals intent upon laundering drug profits through his new land development venture threaten their plans—and their lives. Logan and his team join forces with federal drug enforcement agents to entrap the criminals. Government protection is not enough, though, as Logan loses a member of his team and finds himself in a battle to the death on land and sea. Now Logan must fight to save his crew and his dreams and end the reign of a drug cartel. This will be a must own for anyone in the development industry. NOW ON SALE – BUY IT HERE. Find out more by emailing Dr. David F. Parker at info@floridalandgrab.info.